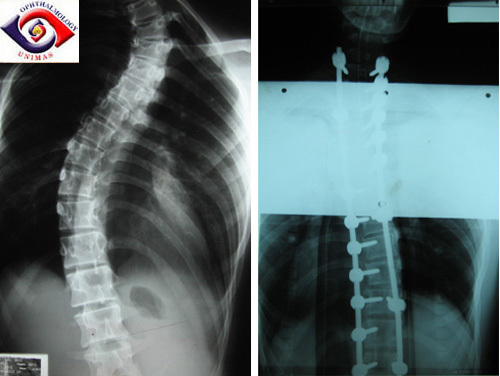 A 15 year-old boy developed a swollen and tight right orbit after undergoing a 6-hour scoliosis operation in prone position (Figure 1). His head was positioned in a horseshoe headrest during the operation. The ophthalmologist on-call was consulted. The visual acuity in the right eye was light perception and the eye movement was limited in all directions (Figure 2) with a dense right afferent pupillary defect. The fundoscopy showed swollen optic disc with flamed haemorrhages and retinal pallor with "cherry red" spot in the macula. The intraocular pressure measured 60mmHg. A lateral cantholysis was performed and the patient was given intravenous acetazolamide. Although the intraocular pressure was lowered the vision remained poor and failed to improve after 24 hours. 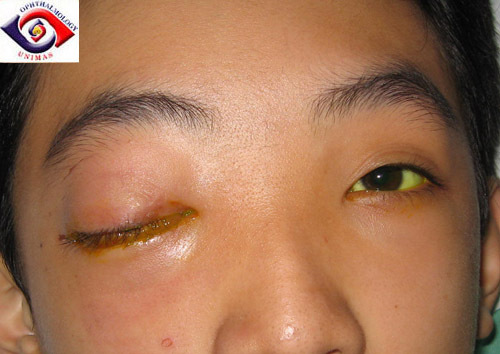 He was started on oral prednisolone which helped to reduce the orbital swelling and improve ocular movement but the vision remained light perception one week post-operative. 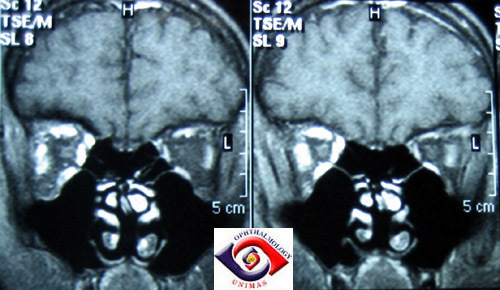 The MRI scans (Figure 3, 4 & 5) showed swollen orbit with extraocular muscles swellings and thickened sclera. Figure 2. Swollen and tensed right orbit. Figure 3. Restricted right ocular movement in all directions. Figure 4. 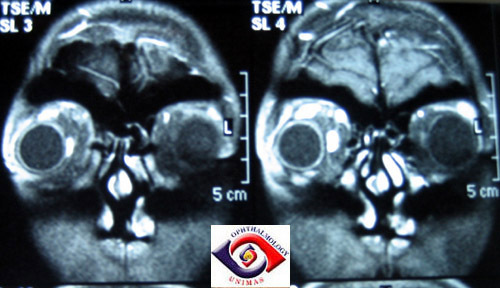 Coronal MRI scans showing swollen extraocular muscles. Figure 5. 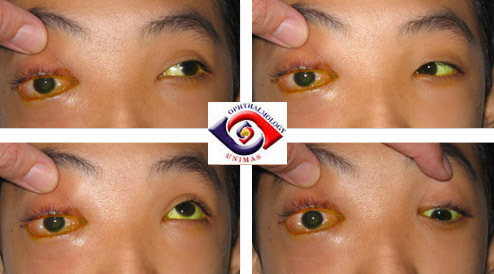 Swollen extraocular muscles with thickened sclera. Figure 6. Axial view of swollen right extraocular muscles and proptosis. a. What are the causes of postoperative visual loss? b. What is the most likely cause of visual loss in this patient? c. How may the blindness in this patient be prevented?